Robert completed his Ph.D in Organizational Leadership at Eastern University with a specialization in nonprofit organizational leadership. Before this, Robert attended the University of Edinburgh where he studied at the Centre for the Study of World Christianity and earned a M.Th. in world Christianity. He is also a graduate of Evangelical Seminary, where he earned a M.Div with a concentration in global and contextual studies. In addition to his work at Evangelical, Robert has served as the associate editor for the International Journal of Multicultural Education. 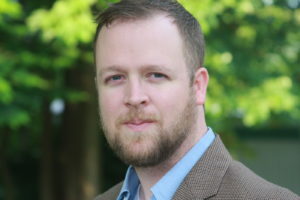 He has also published in a variety of academic journals specializing in the fields of theology, world Christianity, and organizational leadership. Currently, Robert serves as the lead pastor of Revive Community Church, a church plant of roughly 110-130 individuals. Before this, Robert served as a local pastor in the United Methodist Church. Robert is married to Cas, an amazing woman of God; and they are so very thankful for God’s gift of Aiden, their incredible 7-year-old daughter.